This years A+A Dusseldorf exhibition was the perfect platform for Centurion to celebrate current strategic partnerships and develop new ones. At the forefront of the stand, digital tablets gave visitors the chance to get an in depth understanding on Centurion’s product strategy, vision for the future and deep-seated category beliefs. 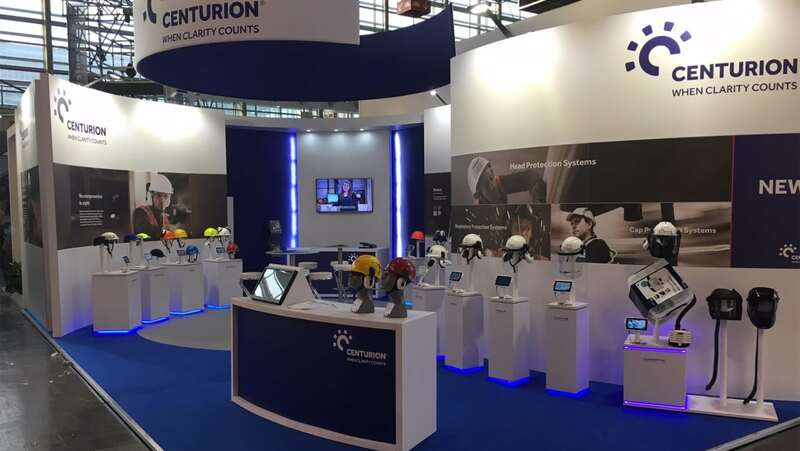 Centurion launched both the Contour face protection range and the ConceptAir respiratory kits at the show, visitors got the chance to get hands on with the new products and understand how the user driven innovations solve wearer problems. Further to the four successful days at the exhibition centre, Centurion took the opportunity to engage and reinforce relationships with their valued partners as they hosted two events. These events were focused on getting closer to partners, highlighting the multiple sales and marketing tools available and giving customers a view into the future. The events were concluded with the first Centurion partner awards, these were presented to customers to celebrate the successes of 2017. Centurion also utilised A+A to gain insight into the market and get feedback on future innovations and product strategy. The insight and innovation centre, led by Michelle Locke, Centurion’s Head Protection Systems Product Manager, gave an opportunity for customers to help shape the development of forthcoming products.